The Italian Food Rule: No pizza for lunch. In the U.S. pizza is eaten at any time of the day – even cold for breakfast in dorm rooms on every college campus. Italians refuse to eat food served any which way, at any time of day or night. The reasoning behind this Food Rule is exact: Pizza is to be eaten at a pizzeria at night because: 1) pizza must be made to order (no frozen pizza); 2) pizza must be eaten immediately after it comes out of the pizza oven (no take out); 3) pizza must be made by an expert – not a generic cook – a pizzaiolo (preferably born in Naples), who 4) is using a wood-burning pizza oven. A wood-burning pizza oven takes a long time to get to the proper temperature (485º C or 905º F), so it will not produce the perfect pizza before 8:30 or 9 in the evening and it is usually considered a waste of time and energy (as well as a violation of the Food Rule) to fire it up for lunch. Pizzerias stay open until midnight or later, so a pizzaiolo gets in a full shift of work from prep at 7pm to clean up at 1am. Another reason for the Food Rule is that pizza, unlike pasta, is considered a social food – a food for lovers and friends, not family. Pasta is associated with home and Mom’s cooking. Traditionally, Italians were expected home for lunch for Mom’s pasta. After Mom started working outside the home, the pasta meal moved to dinner – everyone was still expected to have their feet under her table at 7pm and pasta was served more times than not. Since the perfect pizza can’t be made at home (no kitchen oven reaches 485º C and most of the private wood-burning pizza ovens built in Italy are installed on the request of foreigners who want a “true Italian experience” at their vacation villa or Tuscan farm house), it becomes a social event. Pizzerias provide an upbeat, carefree, casual environment (no worries about getting tomato sauce on Mom’s favorite tablecloth). 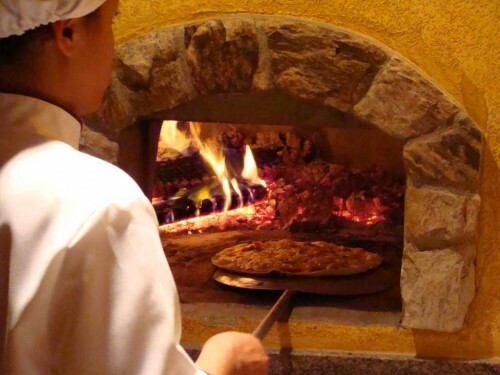 If there is a wood-burning pizza oven, it is usually on display, as is the pizzaiolo, adding to the festive atmosphere. Americans are frequently disappointed with the pizza they eat in Italy. Of course, this is mainly because they ignore the Italian Food Rule: No pizza for lunch. But it is also because they expect Italian pizza to be like the pizza in Chicago, heaped high with everything. Perhaps generic pizza is more of an American fast food than a traditional part of Italian cuisine. Whereas, Italians have eaten pasta since the 12th century, pizza is relatively new on the scene. “In 1780, the pizzeria Pietro e basta così (which means “Peter and that’s enough”) started its activity in Salita S.Anna di Palazzo near P.zza del Plebiscito. 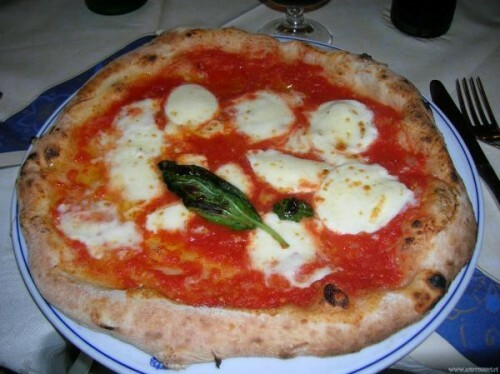 Its pizza, already extremely favored by the Neapolitans, soon became famous and appreciated in the whole city. 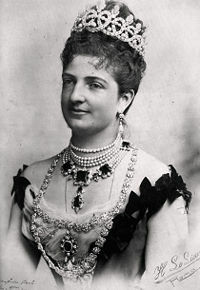 Just over 150 years ago, Italy was a land of city states – Florentines did not eat what Romans ate and Venetians did not eat like the Sicilians. 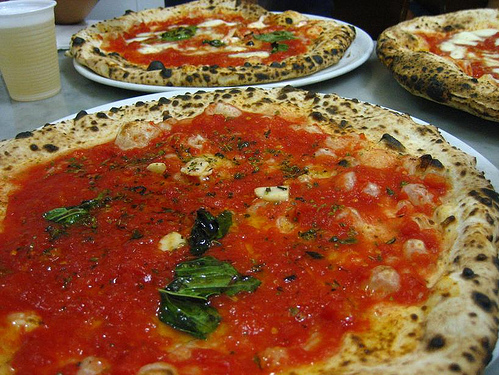 Pizza was strictly a food of Naples. But as World War One loomed, Italians from Naples emigrated to the U.S. In 1905, the first Italian pizzeria opened in New York and the fad spread much faster in the states and the rest of the world than it did in Italy. The uneven nature of pizza quality throughout Italy, of course, led to new Food Rules. Purists, like the famous pizzeria Da Michele in Naples consider there to be only two true pizzas – the Marinara and the Margherita and that is all they serve. The Marinara has a topping of tomato, oregano, garlic, extra virgin olive oil and usually basil. The Margherita, is simply tomato sauce, mozzarella di bufala, fresh basil, and extra virgin olive oil. In Florence, Enzo, the pizzaiolo at Osteria Cafe Italiano serves three – Marinara, Margherita and Napoli (with capers and anchovies). Due to the large number of pizzerias in Naples, the Associazione Verace Pizza Napoletana (True Neapolitan Pizza Association) was founded in 1984 to certify the pizzerias using the proper ancient artisan traditions of authentic pizza. They have illuminated signs outside of pizzerias that follow their methods so Neapolitans know where to go for pizza verace. 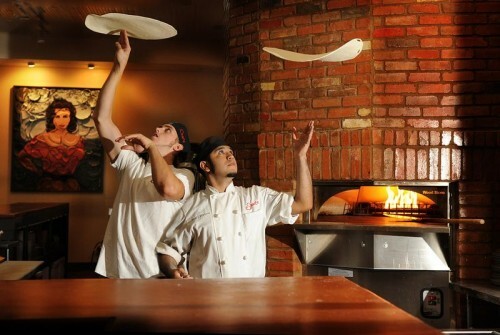 The association set out very specific rules that must be followed to create an authentic Neapolitan pizza, including using ‘00’ flour (highly refined Italian flour), San Marzano tomatoes (grown in volcanic soil surrounding Mount Vesuvius – less acidic and slightly sweeter than other tomatoes), and Mozzarella di Bufala or Fior-di-Latte (fresh mozzarella made with milk from either water buffalo or cows). The dough must be hand-kneaded by the pizzaiolo and must not be rolled with a pin or prepared by any mechanical means, the pizza must not exceed 35 centimeters in diameter or be more than a third of a centimeter thick at the center. 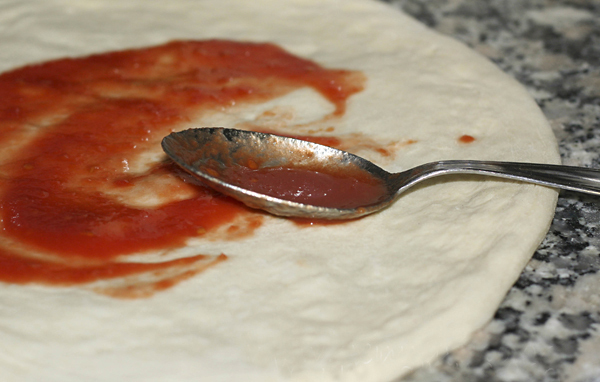 The sauce is spooned on and spread with the back of the spoon into a thin layer. Other ingredients are not piled on, but are scattered in a haphazard way. The pizza must be baked in a wood-fired, domed oven at 900°F for no more than 60 to 90 seconds. Eccola! The perfect Margherita pizza – the crust is thin, dry and golden at the center; the edge is thicker, breadier and slightly scorched; the sauce is bubbling, but does not pool in the center; the cheese is melted and strings out as the slice is lifted (though some claim another Food Rule – pizza is to be eaten with a knife and fork); the two or three green leaves of basil are whole and only slightly cooked; and finally, a swirl of fresh extra virgin olive oil is added as an accent before the pizzaiolo releases it to the table. Leftover pizza is left, not taken home. Do not ask for grated Parmesan for pizza. Hot chili pepper (peperoncino) in oil or as powdered flakes is an accepted condiment. Pizza may be eaten by the slice, usually while standing, at lunch. It is sad to eat pizza alone. 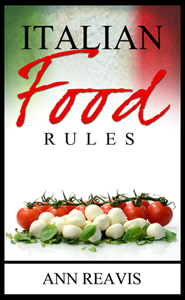 Can you think of other Italian Pizza Food Rules? What are your favorite pizzerias in Italy?